The PartsXpress branding was developed to show our customers and partners our commitment to fast turnover in our high stakes industry and to set the standard for service. Our entire team is dedicated to this philosophy and are stakeholders in it. In our pursuit of the finest possible system of delivery, our PartsXpress division and AMW are partnered to bring our machining capabilities online and in tandem so our customers do not have to outsource machined parts. With two locations (Alabama and Arkansas) we are poised to meet any supply challenges. Also, we have dedicated staff in all sectors (Poultry, Meat, and Prepared Foods) and have the resources to handle most all demands. Call and let one of our sales professionals assist you and see for yourself what service is supposed to be. 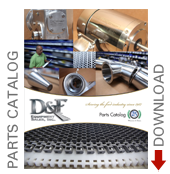 The past several years have been important for D&F as we have expanded our machine shop sister companies AMW (Alabama and Arkansas Machine Works) along with many capital projects streamlining our workflow and major changes in the organization of resources within the company. © 2015, 2018 D&F Equipment Sales, Inc.